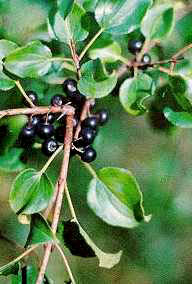 Buckthorn is a shrub or a small tree growing up to 20-25' tall. It has gray to brown bark and when cut it will reveal yellow sapwood and orange heartwood. Twigs often end up to be small sharp spines. Leaves: Leaves are oval with tiny teeths and veins curving toward the tips. They will stay green very late into fall. Flowers: Small greenish yellow leaves will bloom in May and June. Fruits & Seeds: Female trees produce many clusters of round black pea-sized fruit. Buckthorn invades forests, woodlands, oak savannas, prairies, fields, and roadsides. It leaves out very early, thus blocking sunlight to lower plants and will keep leaves very late in the season.